.★The line is parallel, can be cut off more than the part, to achieve the appropriate length of the installation, without affecting the use of the lamp, but can not reduce the main line, otherwise it will cause damage to the product. ★For long time no use, please take out the batteries. 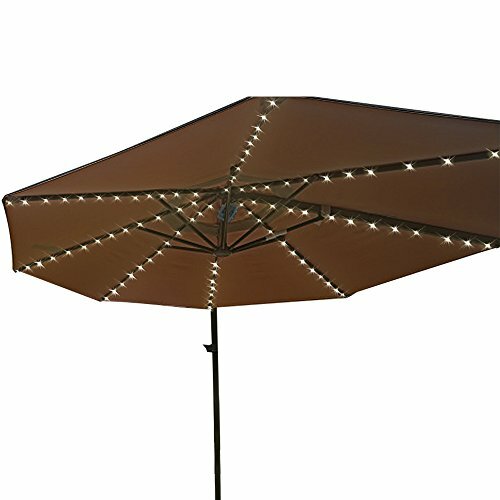 【104 LEDs Umbrella Lights】It has 8 strings and each string is 1.3m. 13 LED Per string, Super Bright LEDs, Widely used for camping tents, garden, yard, cafe, coffee shop, beach and other outdoor places. 【8 Flash Modes with Remote Control】Combination, In Waves, Sequential, Slow-glow, Chasing/Flash, Slow Fade, Twinkle/Flash, Steady On. You can use any mode you like at anytime and anywhere. 【IP67 Waterproof Umbrella Lights】Made from IP67 Waterproof cooper wire, IP65 Waterproof battery box. It can withstand all kinds of weather, including heavy rain and snow, perfect for outdoor decoration. 【Safety & Energy Efficient】Lower voltage 5V power supply. Battery operated 3 x AA battery powered (Not Included) .This Umbrella lights make touchable while working, safe for children and there is no risk of electric shock. If you have any questions about this product by Asobilor, contact us by completing and submitting the form below. If you are looking for a specif part number, please include it with your message.